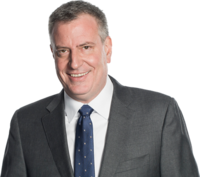 Mayor Bill de Blasio is the 109th Mayor of New York City. Together with his wife Chirlane, Bill is the proud parent of Chiara, a college sophomore, and Dante, a high school junior. Having raised their children in Brooklyn and sent them to New York City public schools, Bill and Chirlane understand firsthand the fundamental role parents and teachers share in educating the next generation - and of the importance of providing equal educational opportunities in all neighborhoods. After graduating from NYU, Bill studied at Columbia University's School of International and Public Affairs. He began his career in public service as a junior staffer for New York City's first African-American mayor, David N. Dinkins, and later became an assistant for community affairs at City Hall. In 1997, Bill moved to the U.S. Department of Housing and Urban Development, working as Regional Director under then-Housing Secretary Andrew Cuomo, as New York and New Jersey's highest-ranking official in the department. In 1999, Bill joined District 15's School Board in Brooklyn. In 2000, Hillary Clinton asked Bill to manage her historic campaign for the U.S. Senate. Two years later, Bill started his service on the New York City Council, representing the diverse Brooklyn neighborhoods of Park Slope, Sunset Park, Boro Park, Carroll Gardens, Cobble Hill, Windsor Terrace, Red Hook, and Kensington. In his eight years on the City Council, Bill focused his efforts on improving public education, engaging parents, expanding affordable housing, and protecting New York's middle-class and working poor. In 2010, Bill was sworn in as New York City Public Advocate, the second-highest citywide elected office. As Public Advocate, Bill launched the "NYC Worst Landlords Watchlist" to publicly identify landlords who took advantage of everyday New Yorkers, pressing them to improve building maintenance and upkeep. Wildlife Conservation Society NYC zoos, national and international conservation projects, research and education programs. Ron Moelis Ron Moelis is a co-founder and principal of L+M Development Partners (formerly L&M Equity Partcipants) and also a principal in L+M Builders LLC. Who is behind education privatization in New York?